How To Add Decorative Accents To Your Living Room? 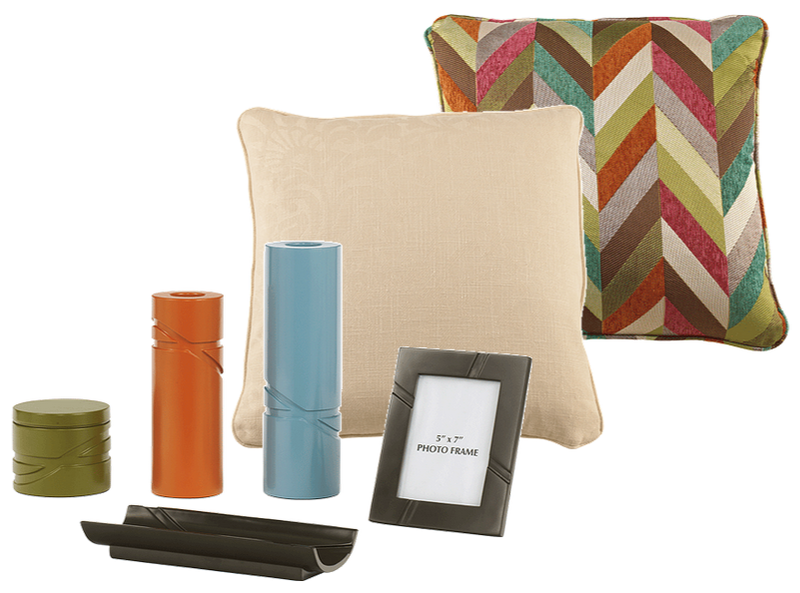 Which color scheme are you using in your living room? What kind of ambiance do you want to make? Is there a common theme in your living room (florals, vintage, monochrome)? Do you want to keep this theme or change it? Where do you want to add decorations? Why do you want to add decorations? Based on these questions, you should be able to make a good choice. First of all, if you have kids, it is not recommended to choose fragile decorations like a glass vase or pottery for places they can reach. Adding some decorative candles and/or printed pillows can be a good alternative. Make sure that you find the same color at least in 3 items and not more than 5 colors (different tones don’t count as a different color if they are similar). Too many different colors in the same room make it hard to match them. Don’t be afraid to use textures and patterns, but not more than 3 (you don’t want your living room decor to be inconsistent). Choosing a theme helps to choose the textures and patterns. Keep in mind the size of the room while you’re shopping; too much decoration rarely gives good results and make the small rooms seem smaller. Adding decorative pillows can make all the difference, you might try this before adding anything else. Tomorrow is Remembrance Day! Although, it is not a countrywide statutory holiday ; we will all take some time to remember men and women who have served, and continue to serve their country during times of war, conflict and peace. 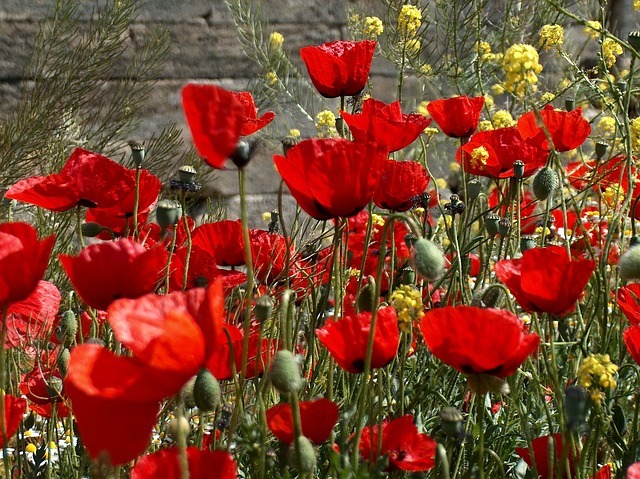 Remembrance Day ceremonies will be held at cenotaphs or Museums throughout Canada. 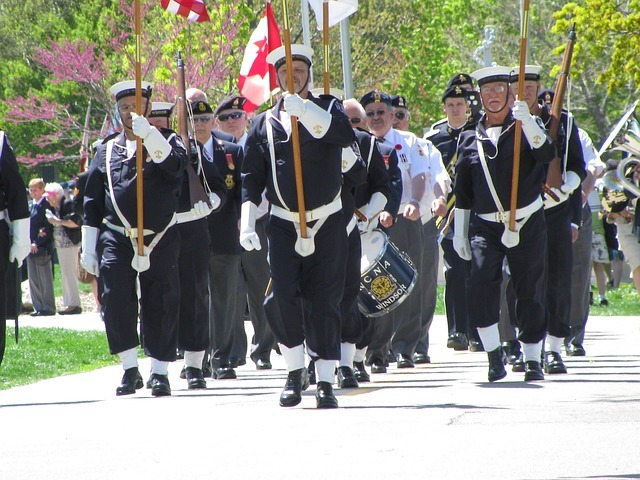 Hosted by officials, veterans or military forces depending on the place, the community will participate in demonstrating their remembrance to their country heroes! Parades, chorales followed by receptions will be on the program for some cities. Some shops will even “commemorate” with some great deals. What will you do at the 11th hour of on the 11th day of the 11th month to remember them? Why not start simply! Wear a poppy and salute our Canadian military! The living room or family room is known to be the family’s favorite room to chat together and spend some quality time. This room should combine a mix of warmth and comfort, in order to enable a family to be inclined to gather in this space. Style, comfort and quality all matter to pull off this setting. In order to achieve this mood, one must select the appropriate pieces to blend together. Blending furniture pieces in a living room does not necessarily imply that they must be from the same collection. On the contrary, a good living room design is a mix of cohesive pieces that blend in color, style and texture. In fact, one might say that even some opposites work well together to create an eclectic mix. The Azlyn sofa features a vintage casual style, and infuses a mixed media look in such an elegant manner. 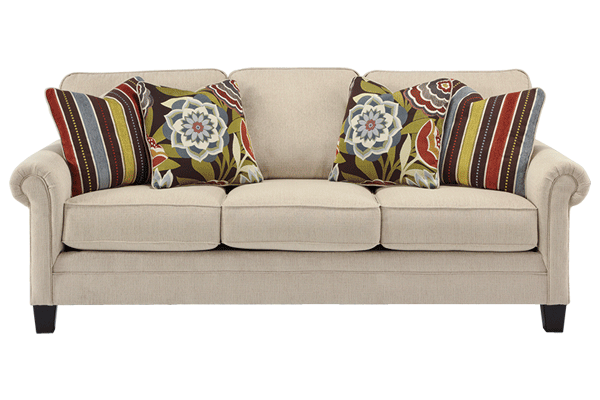 In this mixture, we have exposed feet in a wood finish, a nailhead trim and gorgeous tufted upholstery. The curvaceous rolled arms provide added character to the sofa. Despite the elegance of the piece, the warm earthy tones create an inviting atmosphere. The Kannerdy chair features elegant refinement and rugged good looks that blend beautifully with the selected sofa. The dramatic style of the turned feet and the Charles of London arms enhance the English style with this pairing. In addition, the muted neutral tones harmonize well together and create an opportunity to add little pops of color in the room. Lastly, depending on the dimensions of your room, for an optimal design, allow for two chairs facing the sofa. Finally, the Hindell Park ottoman features a vintage casual style with button tufting detail. The soft upholstery brightens any room with its colorful and soothing pattern. You’ll enjoy the comfortable atmosphere set by this ottoman once you have your feet up! Although these pieces are very different and unique in their own way, some key elements such as the similarities with the feet, the muted natural tones and elegant refinement make them mesh well together. The floor standing lamp is a traditional fixture that comes in different shapes and designs. It is a great way to add style & ambiance to a room, since they do not cover as much ground. This fixture is perfect for a living room, as it can serve well for reading or lighting the room while enjoying your favorite tv shows. A pendant light fixture is one that hangs from the ceiling by means of a cord, chain or rod. It usually includes one to several lightbulbs that are not combined into one single unit. The beauty of this fixture-type is that you can find many styles, colors, and even textures! From vintage-inspired glass, to industrial metal and a casual organic weave, a pendant light fixture will bring a unique accent to your room. The table lamp is yet another classic. This lamp will ensure that any table in your home has perfect lighting. It is the ultimate measure to fine-tune your atmosphere in a room, whether you need extra lighting or want to dim the room. They come in a number of shapes, sizes and colors. From bold to muted, you will not have any difficulty finding your desired look. Choosing a light fixture has become less mundane, as today’s wide selection will not only help you achieve a well-lit room, but also give you an abundance of style options. Begin by decorating your home with colorful lanterns, tiny palm trees and miniature parrots to bring the tropical feel that Brazil has to offer. It will certainly get everyone in the right frame of mind. For a moment, they might just forget where they are! If you’re going to have guests over to watch the opening of the Olympics, or to view one of your favorite sports, then food is a must! Set up a table with different foods. Try to be creative by assembling cold dishes that resemble flags! Perhaps the most significant element is to have the right furniture to accommodate your guests. Obviously, the larger the group, the more seating that will be needed. Ideally, a large sectional would definitely do the trick! If you are planning on serving savory tropical drinks, then a coffee table or ottoman would definitely be handy! That way, you have somewhere to rest your tray. Finally, a tv stand would be optimal to keep the tv at perfect eye level. In order to stir up some team spirit, you may want to create a scoreboard to record how many medals your favorite team is receiving. Also, encourage your guests to wear something that supports the team(s) you are cheering for! Now that you have your party outlined, you’re all set to have a good time! Remember, “Every champion was once a contender that refused to give up” – Rocky Balboa. We can all learn a little from these hard working athletes! According to Pantone’s fashion trends, the 2016 top fall colors offer a nice combination of strength, confidence and complexity! From the sky to the ground, these meaningful colors embody strong feelings and concepts that can be used to show your personality. 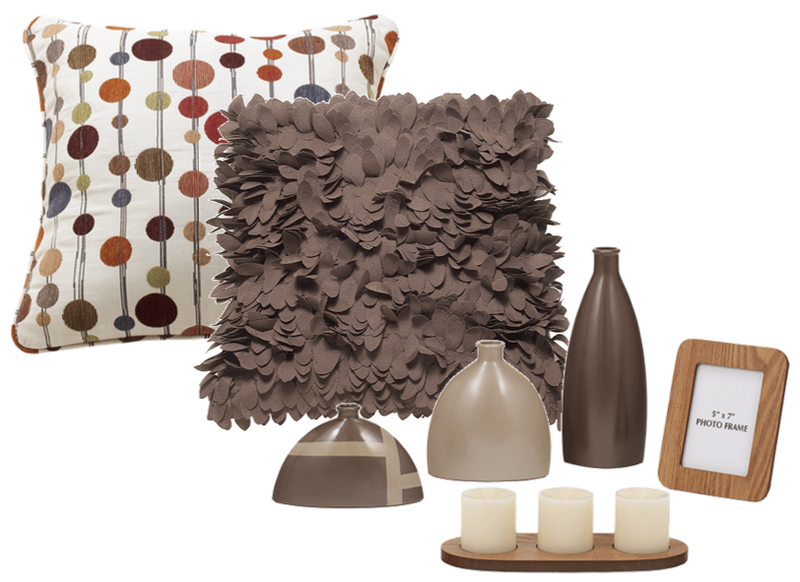 Ashley Furniture and home accents have a nice touch of this color palette in its collections; so if you would like your home décor to be “a la mode”, then you have found the perfect brand! Let’s have a look at how these selected colors can find the right place in your home. If you are keen about the sky and sea, here’s our selection: Blue hues – Riverside and Airy Blue which are the dominating colors in the 2016 fall trends. Blue represents consistency and confidence while gray gives a feeling of stability. Are you tempted by a complete 2016 fall palette makeover? AshleyFurniture offers the perfect sets for your bedroom and dining room!